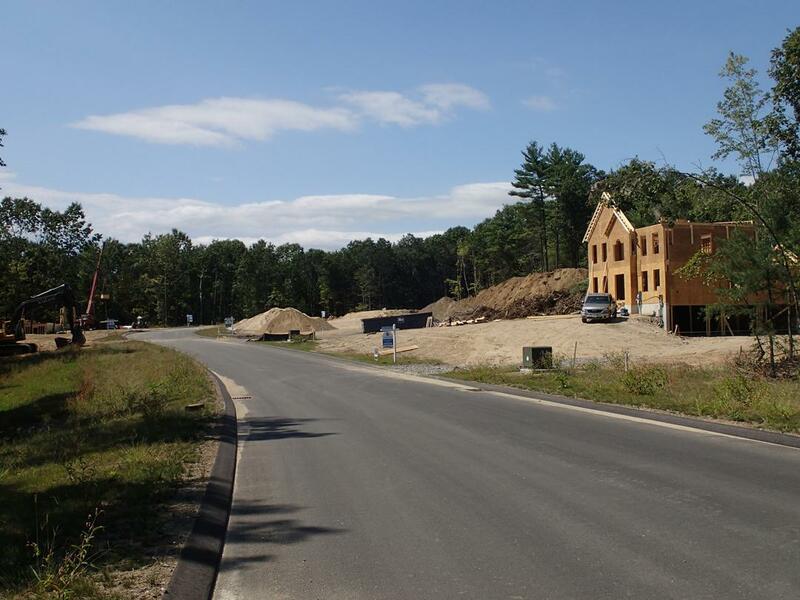 Spruce Pond Estates is in the midst of an exciting expansion with twenty new lots available for custom building. All of the recent inventory has been sold or is under agreement. Pictured above is a sold home being custom built for a new owner on the Taninger Road cul-de-sac. Taninger Road has 12 home sites. There are several other foundations in with new construction beginning on distinctive designs offered by H&B Homes. There are also 8 lots available on Mallard Road. One of the pictures in this post shows the new paved access to the Windham "rail tail" which offers over 8 miles of paved trails for biking and walking. This is one of the most beautiful recreational assets available in the town of Windham NH. Mallard Road no connects the neighborhood to the center of town with easy access to schools and other amenities of Windham. This "Wilson" model is being built on a beautiful lot on Jacob Road. Jacob Road, when complete, will be a cul-de-sac. The home itself features a beautiful entrance porch. The house itself is highlighted by a spacious first floor office off the foyer and a wonderful family and gorgeous custom kitchen. The master suite features a luxurious spa bath. Why not check out the new lots at Spruce Pond Estates this Sunday and discover why you should make this popular new neighborhood your home. Open House every Sunday 12-3.